Small - $106.99 Only 6 left! Medium - $106.99 Only 6 left! Do you remembering dancing with your parents when you were little? Your feet were firmly planted on their shoes as they slowly stepped to the music, making sure you didn't slide off. Learning to take those first few steps can plant a clear vision of the future in a child's head, one that's full of dancing and gowns and maybe a few string quartets. Sure, that vision for the future might not be accurate but why not embrace that magical outlook on life that children seem to take on so easily. That's why it's so great to look back on the Disney classics and share them with your little ones. When you're with your daughter watching Belle ride through the woods on Phillippe, the horse, you can relive that at the edge of the seat feeling that you used to feel when you were your child's age. And when the magical ballroom scene comes along it's a treat to watch your daughter take in the sparkling candle light, the beautiful scrolling gold-work on the walls, and of course, the iconic golden dress, so unforgettable to a whole generation of dreamers. In this gorgeous Belle gown your child will feel like she's been dressed by the dramatic wardrobe, Madame de La Grande Bouche. The skirt is full with layers of tulle underneath the golden fabric and layers of gold detailed chiffon over the skirt. The dress looks just as it did in the movie with sheer golden layers of fabric highlighting the bodice. You may not be able to organize that string quartet to play in your living room but it doesn't matter. 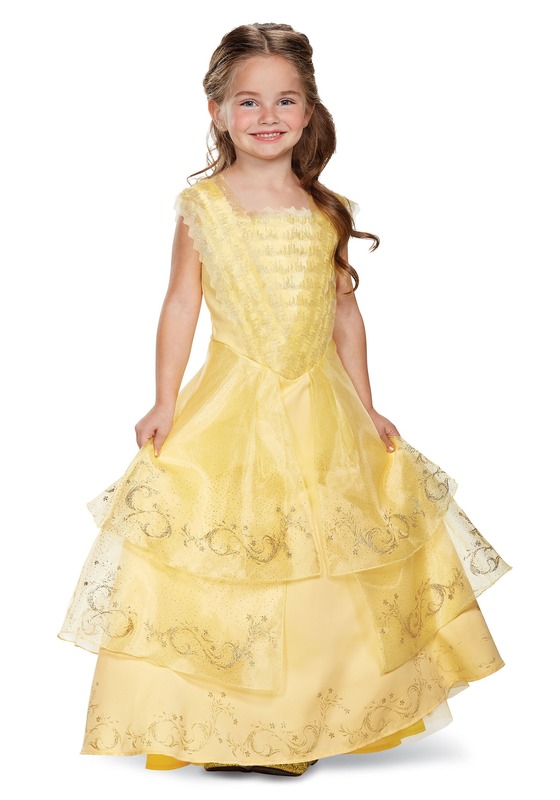 When your little girl is wearing this dress, her fairy-tale dream has already come true.